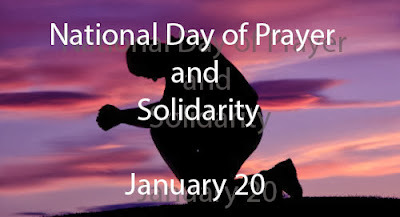 'One Nation in Prayer' is the theme of the event on Monday, January 20, 2014. President Benigno S. Aquino III declared the National Day of Prayer and Solidarity in the said date. All Filipinos are encourage to show support and be part of the National Day of Prayer and Solidarity. Presidential Communications Operations Secretary Herminio Coloma Jr. said, "The National Day of Prayer and Solidarity with the theme ‘One Nation in Prayer’ is going to be held in accordance with the Filipino people’s recognition of the guidance of Divine Providence in our forward movement towards a more progressive future." The prayer assembly will be lead by our President Benigno S. Aquino III but the details about the event are not yet release. PNoy said, "Our unbreakable spirit and ability to recover find root in our firm belief in a benevolent God who has the perfect plan for all of us. These tragedies tell us that despite all our efforts, we are indeed powerless without God." For the meantime, If you feel that this story are informative, please bookmark it now or visit this site more often for you to be updated. You may also share this post to your friends so they may know about National Day of Prayer. Comments or suggestions about "Philippine National Day of Prayer on January 20" is important to us, you may share it by using the comment box below.